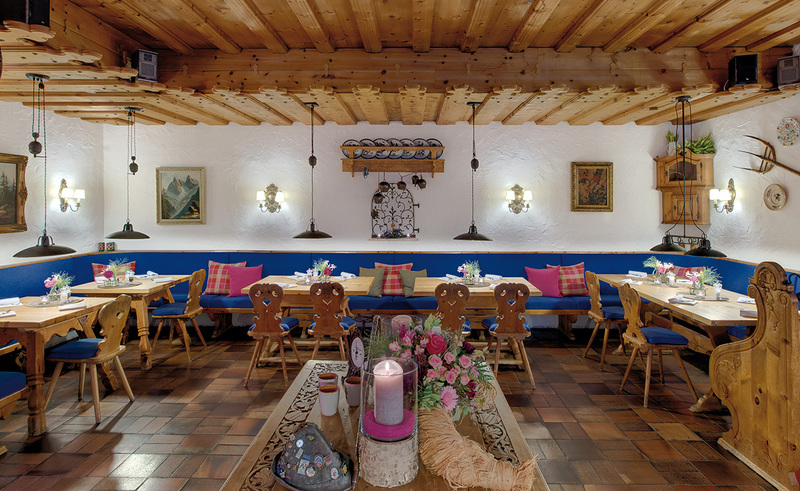 From November to March guests can enjoy Swiss delicacies in the rustic Fondue Stüberl (“Stone Pine Room”) of the Grand Hotel Sonnenbichl. In the winter months, all of Garmisch-Partenkirchen adorned with a thick layer of snow. The whole town then looks as though it has been dusted with powdered sugar and provides romantic flair. During this period many winter weddings are held at our hotel. And, of course, all the snow is a dream for winter sports fans: whether hiking in snow-shoes, cross-country skiing or just watching the professionals at ski-jumping, in Garmisch-Partenkirchen you always get your money’s worth. Guests also like skating on the frozen-over lakes surrounding the town. 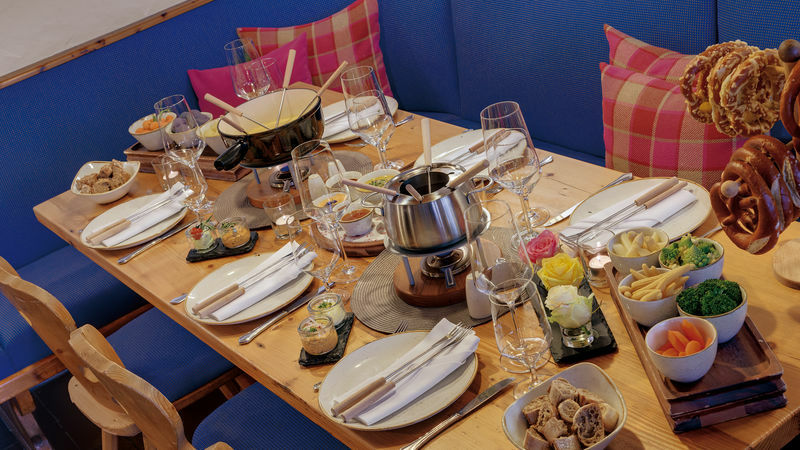 After an active day in the cold air, you can warm up again in our cosy Fondue Stüberl and get your strength back with delicate fondues. The ceiling of this “farmhouse parlour” is made of best stone pine, which contributes to its own special charm. The stone pine is a very special tree and is also called “the Queen of the Alps”. In this room, wood radiates comfort and cosiness and gives off a pleasant conifer scent. 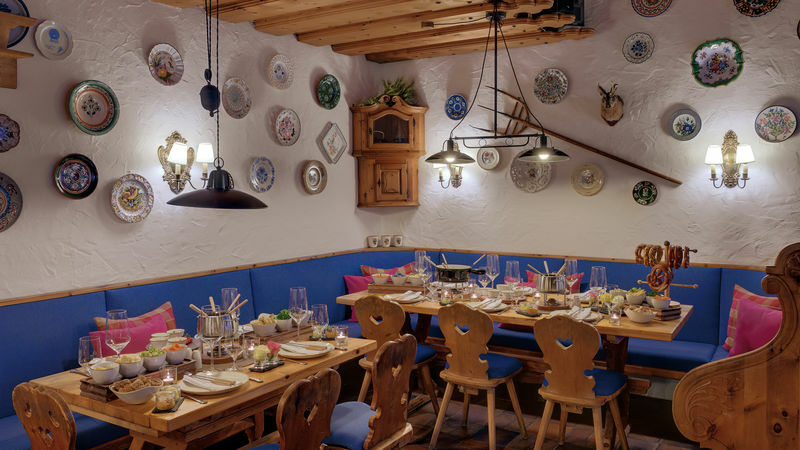 This atmosphere stimulates a big appetite and makes you keen for a delicious fondue. 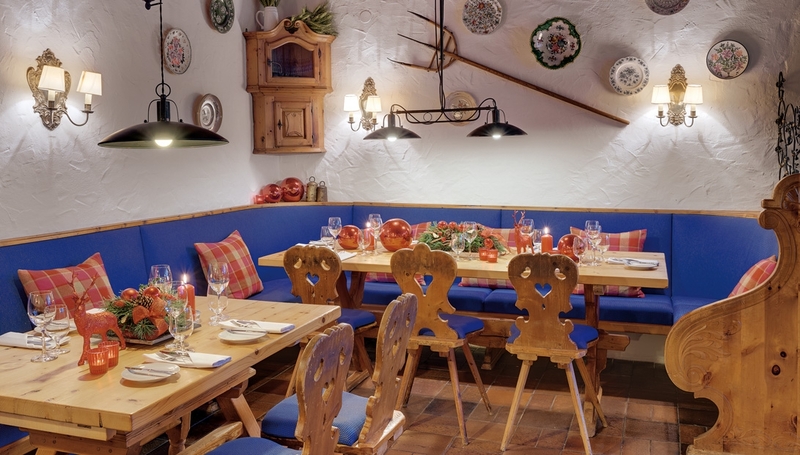 Chef Stefan Kappel and his team serve classic fondue with regional meat, cheese fondue with Swiss cheese or chocolate fondue with cut-up and sugared pancakes. After completing his apprenticeship as a cook, the native of Marburg gained more experience at the Hotel Suvretta-House in St. Moritz. His last position was in the kitchen at the Hotel Maximilian in Oberammergau. We are very pleased to have obtained his services as a chef for the restaurants of the Grand Hotel Sonnenbichl. Besides tasty, good-quality food, Stefan places much importance in his cuisine on using fresh, regional products with seasonal specialities. This is also reflected in the menu. You can also hire the Fondue Stüberl for private festivities. Guests can enjoy a cosy evening here with up to 30 people. If you like delicate fondues, we will be happy to organise your company Christmas party for you.